Sometimes a second chance is all it takes. Lucus Medlin, an independent contractor with TransAm Trucking, is a noble example of this principle. In a video for the Union Rescue Mission in Wichita, KS, Lucus talks about how the Mission and the Trucking Industry helped him turn his life around, saving him from homelessness. The Mission and trucking were there for him when he needed them most. Lucus started with TransAm Trucking after finishing truck driving school in 2015. Now he is a successful businessman as an independent contractor and currently on his way to completing his third, 6-month lease with ONE Leasing. 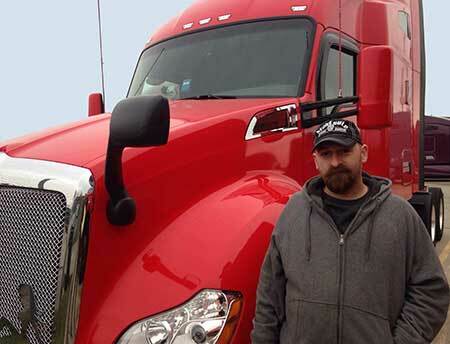 His success in trucking comes as no big surprise to anyone who knows him. Trucking is in his blood. Lucus’s father was a truck driver for 34 years and his grandfather drove as well. In fact, while talking to Lucus about his journey as a truck driver, he mentioned his family hauled freight even before trucks existed, going all the way back to the mule skinner days. He’s very proud of this legacy and rightly so. Truck driving is a noble profession. His enthusiasm for trucking is infectious. He stated that since his time with the Union Rescue Mission he believes in seizing opportunities. He wants to continue advancing his business and is actively taking steps to do so. Consistently one of TransAm’s DriveCam Top Performers, Lucus ranked among TransAm’s safest drivers. He is also took advantage of TransAm Trucking’s Holiday Equipment Availability Pay opportunity. Growing his business makes him happy so he spends as much time over the road as possible. When he’s not hauling loads, he’s giving back to his family by helping his mom with odd jobs or performing maintenance on her house. Trucking is a way of life. It takes long hours and dedication in order to be successful. But for drivers like Lucus the commitment is easy. Truck driving gave him a second chance. Thank you, Lucus, for choosing TransAm Trucking!